Some like it hot, others cold; many countries relish it as a sweet, milky brew and still others, prefer a simple douse of hot water. Tea is as deeply rooted in Indian culture as much as it is in China, Japan and England. Just a cup of this drink is the norm to kick-start the day. Many see it as the perfect antidote to dreaded afternoon slumps. And for the rest, it pairs well with conversation at just about any time of the day. There really isn’t much that can be compared to the uplifting power of a hot cup of tea. While coffee houses are still mushrooming across Mumbai, tea-centric cafes are only just catching up, which is surprising, given that India is one of the world’s largest producers and consumers of tea. I guess it was only a matter of time that the humble cup of tea—enjoyed at home and at street-side stalls alike—seeped into the city’s mainstream culture. Tea Trails in Mumbai’s business district of Bandra Kurla Complex, seems to be making up for all the lost time by serving this aromatic beverage in more than 40 different varieties. It’s the second outlet (the first one’s in Thane’s Viviana Mall), with many more slated to open across the city very soon. I recently visited Tea Trails on a particularly tepid summer afternoon. A cheery air pervaded the cool confines of this sunlit lounge, partly due to its bright melon chairs, posters of tea-related stuff, strings of Mason jars and just a touch of the whimsical in the form of a giant teacup. And if this doesn’t make you smile, the friendly teastas (attendants at Tea Trails) will ensure that you do. The tea list has lesser-known variants like Lapsang Souchong and Tisanes along with popular ones like Jasmine Green Tea and Oolong. Since my days are generally filled with endless cups of green tea, I skipped the tried-and-tested varieties in favour of the Lapsang Souchong— a Chinese black tea from the lounge’s International range of teas. One of the more interesting aspects of Tea Trails is that its co-owners, Kavita and Uday Mathur and Ganesh Vishwanathan, have made sure that all teas served here are steeped right. Your tea will arrive in a glass infuser with a sandglass timer along with a note with the tea’s optimum brewing time and health benefits. 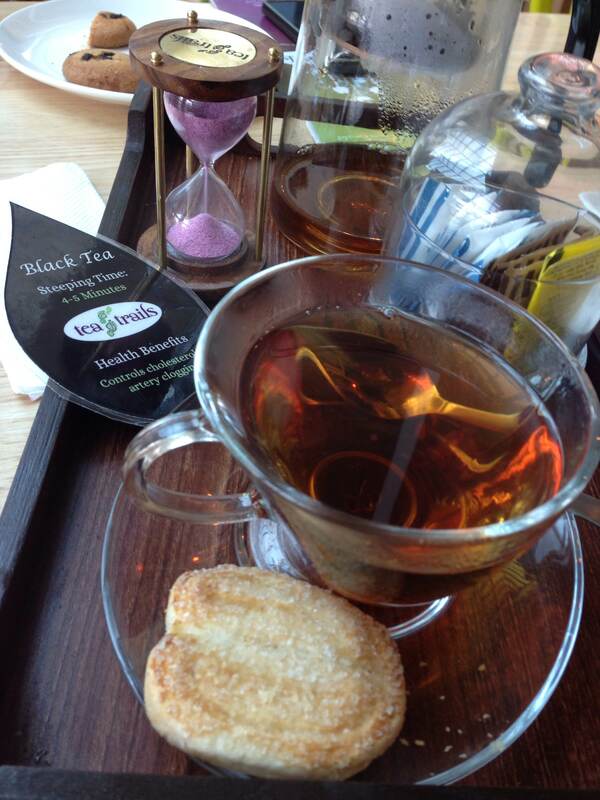 I also love the fact that Tea Trails is a teabag-less zone! 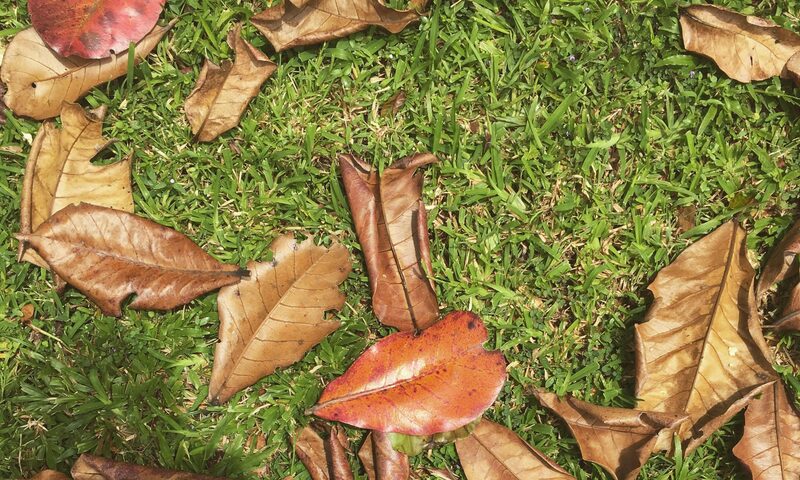 Only tea leaves here. And, each tea is served with cheese straws and palmiers. My Lapsang Souchong tea (pictured above) had a smokey aroma and flavour. Plus, I didn’t feel the need to add any sugar, which was a first for me, given that it was a black tea. A snack of a Smoked Chicken Sandwich paired well with this tea. Tea Trails is definitely doing well on the food front, unlike most of the coffee chains that serve terribly stale and insipid snacks. 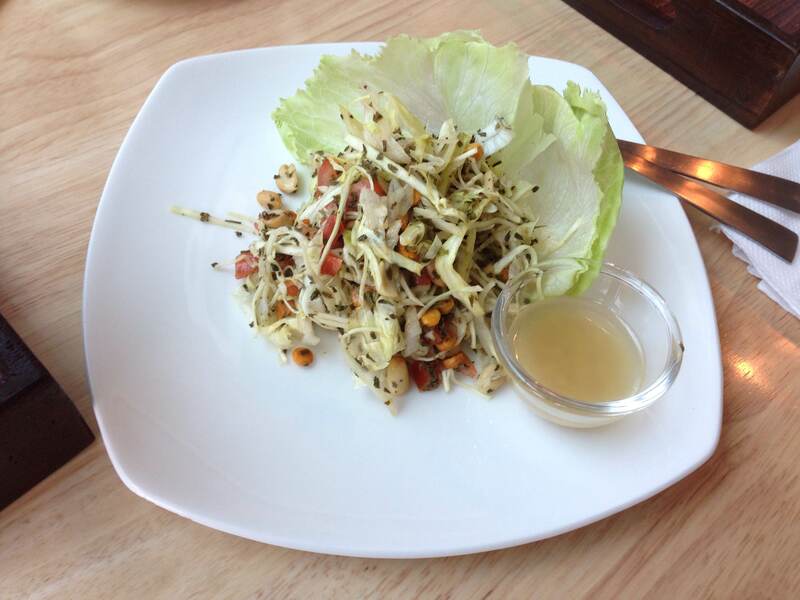 I also sampled the Burmese Salad (pictured above)—a crunchy mix of cabbage, lettuce and nuts doused with a tangy vinaigrette and sprinkled with fermented tea leaves. Next up were some tea-infused cookies, which didn’t really carry a strong taste of tea. Still, they weren’t too sweet at the same time. Kavita Mathur explained that the food infused with tea leaves is not meant to have a strong taste of tea. After trying the salad and the cookies, I felt that the tea leaves served to balance the sour element and the sugary sweetness of the salad and cookies, respectively. Most of the dishes on the lunch and breakfast menu are served with complimentary tea. Of course, if you visit at any time of the day, you can indulge in comfort food from India and across the world ranging from Bun Maska and Pakodas, to scones and pound cake. Or, if you make it in time for breakfast ( 9 am – 11 am), you’ll get to try out the famed tea-marbled eggs. Other basic breakfast items include Poha and Upma, which are bound to be a hit with office-goers in vicinity. But if you are only here to sample and learn about new tea variants, opt for the Tea Explorer, which offers a choice of four tasting-sized teas (you can choose from White, Oolong, International, Green and Tisane), served with cookies, palmiers and cheese straws. A good old cup of chai comes in two flavours—Masala and Adhrak; both are brewed using freshly pounded spices and herbs. While caffeine-intolerant folks can opt for the caffeine-free Tisanes in flavours like Himalayan Spice, Turkish Red Apple and Mixed Berry, the caffein addict can get his or her dose in a brilliantly brewed cup of South Indian filter kaapi. ` Some of the cold teas on the list include Lemon and Mint Iced Tea, Tea Frappe and the exotic Pinacolada Iced Tea. 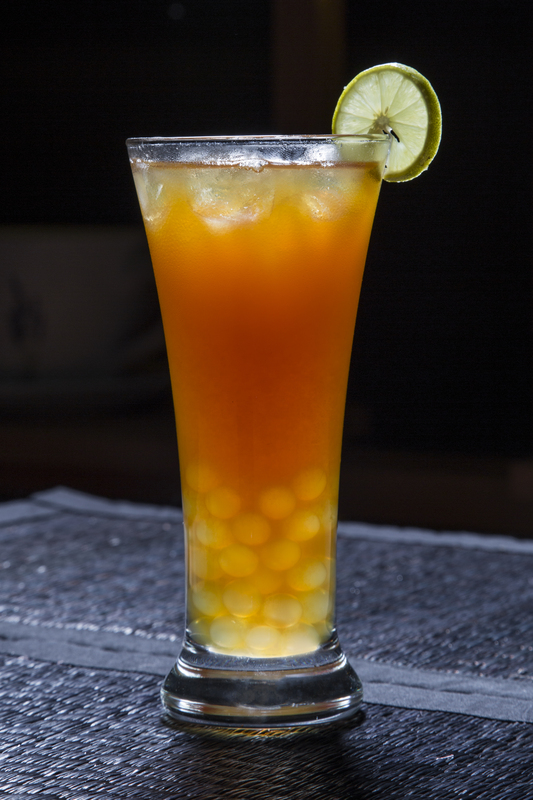 But we suggest you sample their Taiwanese Bubble Tea (pictured above; image courtesy: Tea Trails). Available in lychee (left) as well as mango flavour, the bubble tea makes for a refreshing drink with a surprise element—fruity liquid spheres that explode in your mouth. Thankfully, Tea Trails doesn’t throw in Tapioca balls, which are not exactly fun to chew on unless you’re a teething toddler! With the amount of seriousness given to the good old cup of tea and the rather reasonable price tags, we think Tea Trails is just what the city needs and it couldn’t have come at a better time! Imagine this: Sitting at one of the window-side tables, with a book in hand and a steaming cup of tea, while the rain pours down outside. Yes, we can’t wait to return very soon!